Ecolift is hydraulic oil and battery free, and with no need to charge, has no energy consumption. Ecolift is an eco-friendly solution to Powered Access needs. The Ecolift can get you to a height of 4.2m, is lightweight & easy to manoeuvre with a robust design for years of trouble free service. 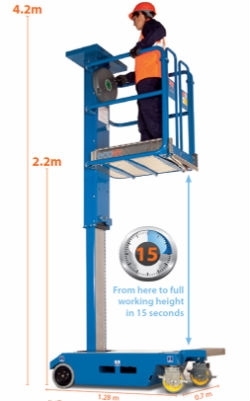 With minimal operational costs, and virtually maintenance free, the Ecolift is an asset to anyone working at lower level heights.